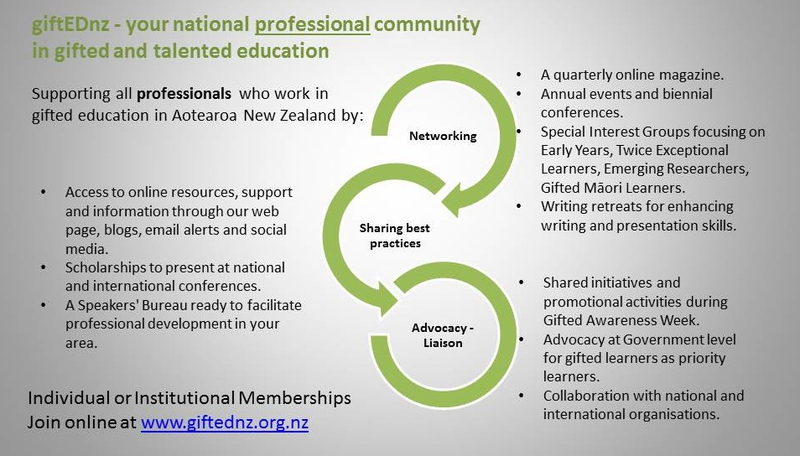 As a member of giftEDnz, you will become part of a national network of professionals involved in advocacy for gifted education. You will also receive a regular email newsletter focused on gifted education issues that will inform you of current developments and opportunities for professional learning, and feature articles about people and activities involved in gifted education practices. Members are encouraged to contribute to the newsletter and, from time to time, will be asked to complete surveys of member opinion to guide us in developing further benefits for members and to develop responses to Government and Ministry of Education initiatives. As the organisation continues to grow, you will receive preferential registration and reduced fees for giftEDnz professional learning opportunities, such as conferences, workshops, and symposiums. Please scroll down for information on the levels of membership we offer. Memberships which have spanned five consecutive years or longer are considered as ‘loyal members’. Loyal members are entitled to discounted subs and other benefits which are not available to other members. Click the appropriate link for the membership you would like and it will take you to the Google Form for you to complete. Includes up to three named people within the institution – entitled to one vote per registered institution, providing membership fees have been paid in full by the due date. Entitled to one vote per registered individual, providing membership fees have been paid in full by the due date. Entitled to one vote per registered student, providing membership fees have been paid in full by the due date. An invoice will be sent to the email address you have nominated once your membership application has been processed. All subscriptions must be paid in full within one month of receiving this invoice and can be paid either by cheque or via internet banking. Your initial membership subscription is valid until the following 31 March. Subscriptions which are rolled over, are then valid for the following 12 month period. Original generation time 1.1030 seconds. Cache Loaded in: 0.0005 seconds.